We provide comprehensive energy efficient solutions for industrial and commercial sectors. 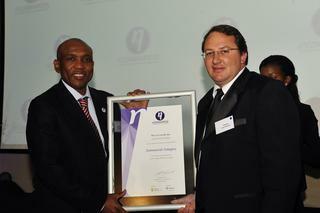 Enestar is an approved Eskom Esco ( Energy Saving Company). We offer award winning solutions and technologies tailor-made to reduce your energy consumption, thereby saving you money with immediate payback on your investment. We can assist/advise regarding financing for energy saving interventions and renewable generation. Rising electricity costs are a reality!!! Enestar will assist and advise you on how to reduce your electricity consumption and implement energy efficient technology with immediate return on your investment......cause every WATT counts. Refrigeration is one of the few systems that are never switched off and operate 24/7 and therefor are one of the largest consumers of electricity, for this reason substantial electricity savings can be achieved. Our e-RACS² energy efficiency refrigeration system won a coveted Eskom ETA Award in 2009 and with over 20 projects completed; this system not saves you electricity, but also reduces breakdowns, stock losses, service repair and maintenance costs. To find out more how you can achieve substantial savings, please contact Trevor Van Onselen @ 0828993777.